The premium AQUAlift buoyancy panels in the lower core and rear raise the hips to put the body in the most efficient swimming position. With the flexibility and buoyant feel of a high-end suit without the price tag, the Wahine 1 Sleeveless is a great triathlon wetsuit. Shipping was very quick even during the Canada post strike. I am a para athlete that does short course triathlon. I also love open water swimming and have been a swimmer most of my life. I got this sleeveless suit to take on a sailing holiday, for training and for fun swims. I love how easy it is to put on compared to my full suit, the full shoulder mobility and the ease of breathing / lack of chest constriction. I’m very happy with the quality and the customer service from Tri Boutique was great! Super fast shipping! Love this sleeveless wetsuit. It's perfect for hot summer racing. My front crawl endurance improved considerably, partly thanks to the strategically placed floatation panels to keep my hips at the surface at all times. It seems well constructed and so far no tearing. 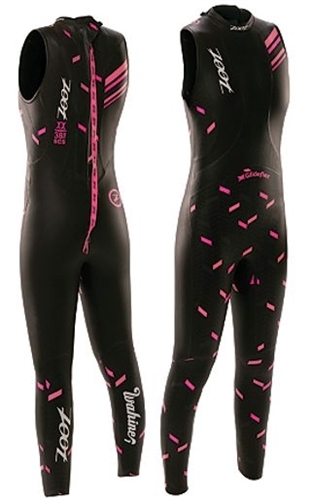 It's a reasonably priced wetsuit that is well suited to midpack triathletes.